Würzburg, September 2012. 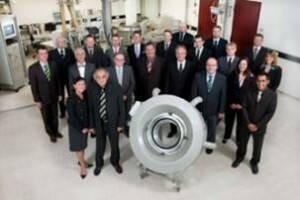 For a quarter of a century, Octagon Process Technology GmbH, Würzburg (www.octagon-gmbh.de), with their sensitive and most precise measure and control technology, have been contributing to blown film manufacturers’ efforts to optimize their product quality and production efficiency. Founded by Professor Dr Veit-Holger Karl, the company began in 1987 with the development of electronic components and soon continued with the production of its own systems which were partly based on company owned patents. Today, Octagon has established itself as a competence centre for the measure and control technology for blown film lines, internationally recognized, with its own specialists and with a world-wide presence via local industrial representatives. The company’s products are used by a multitude of international manufacturers producing a wide range of blown film. They are sold for retrofits directly or by representatives or they are available as integral components of OEM systems. To this day the Octagon range of products includes quality control systems integrated in the automatic control of blown film lines as well as offline systems, all of which help to maintain a uniform film thickness in line with specifications over its length and circumference. This includes the systems of gauge profile control (SmartLip), online gauge profile measurement (PMS), offline gauge profile measurement (GPA-Cap) and gravimetric dosing. Their modular concept permits high flexibility in the adaptation to customer-specific requirements. Prof. Karl, who is still an active company director today, knows what has been responsible for 25 years of continuously growing company’s success: “Octagon has highly motivated specialists, well trained and experienced in applied process technology who are in close partner-like contact with our customers. In this manner, our possibilities of remote diagnostics assure short reaction times. A current example of an Octagon system for increased efficiency, suitable for new lines and for retrofitting, is the automatically controlled triple lip air ring SmartLip TL developed for continuous control of the cross section profile and thus to the cost-diminishing reduction of film thickness tolerances. This air ring is equipped with integrated height adjustment and an additional third air stream, the latter automatically distributing the cooling air around the die perimeter, hereby correcting specific thick spots with less and thin spots with more cooling air. This device enables the output of a blown film line to be increased significantly. The height adjustment device permits a specific handling of the bubble shape (long neck mode) in order to influence the mechanical properties of the film during production. For example, increases of dart-drop-values and tear properties of up to 40 % are in the realm of the possible which in turn opens chances for a reduction in thickness or down-gauging.